I finished this WIP early last week but was waiting to get better photos before I showed it off. However, the opportunity to get better photos is eluding me so you get crummy ones instead because I’m impatient! Hopefully the awesomeness is apparent regardless. This color combination is no doubt, hands-down, my absolute favorite of ALL FREAKING TIME. Yeah. It’s that good. The deep dark teal and pale greeny-blue-aqua together just makes my color-lovin’ heart sing. Not to mention that it coordinates with nearly everything in my closet. Somestimes the Fiasco and I play the “how many matching accessories is Alicia wearing right now” game. I don’t know why but I get a strange OCD thrill from matching/coordinating everything I’m wearing, which I’ve done since at least high school. 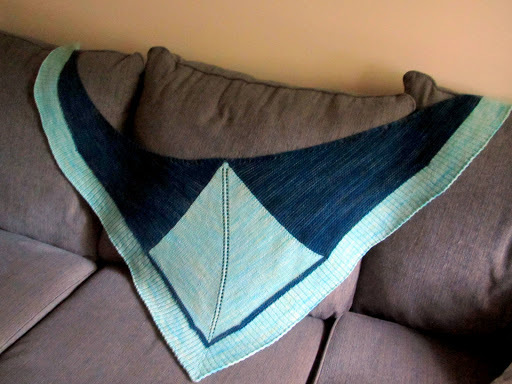 (Aside: but I weirdly hate when people wear an entire outfit all the same color, those velour pantsuit lungewear things from Old Navy drive me crazy…) Anyway, back to the shawl. I started this puppy back in February 2012 and it took me 16 months to finish because it was boring as hell. 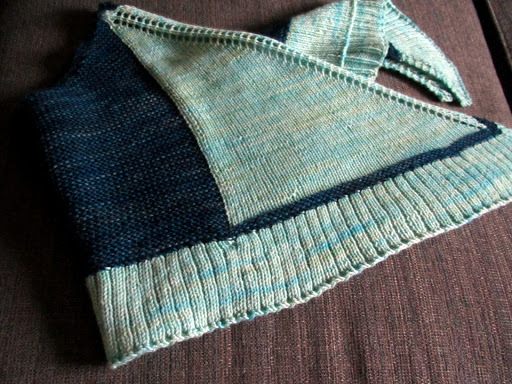 The pattern is Flamboyan by Stephen West and it is without a doubt a clever, striking, and stylish design… I just hated knitting it. I am not a fan of large swaths of stockinette (it’s the purl back rows that get me) and juggling three balls of yarn for the (very simple) intarsia was annoying. And then there were the endless three inches of ribbing for the edging. By the last row there were over 570 stitches on the needle and I think 570 stitches of ribbing is just too much for my taste. 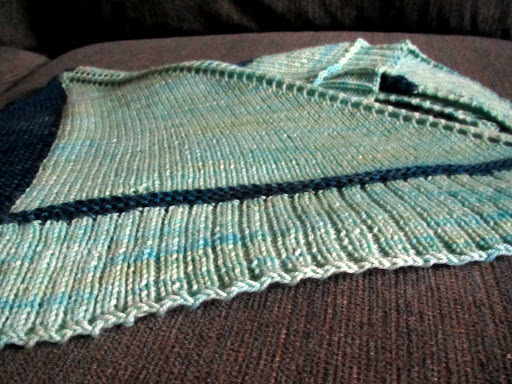 This entry was posted in Bugga, CephalopodYarns, FO, FOFri, shawls by shoelaceswitcher. Bookmark the permalink.